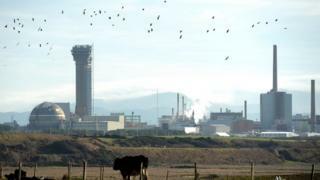 Member of two unions at Sellafield are to be balloted on industrial action in a dispute over pay. Unite, which represents 2,000 of the nuclear plant's 10,000 staff, has described a pay offer of 1.5% as "paltry" and "completely unacceptable". GMB is also balloting its 3,000 union members after 88% of them rejected the offer in a consultative ballot in June. Sellafield Ltd said it was a publically funded organisation and had to deliver value for money to the taxpayer. Graham Williams, from Unite, said: "Low pay awards have been the order of the day for some time at Sellafield with the well-founded suspicion that this award dovetails with the government's harsh pay restraint policies. "The management now needs to come to the table and negotiate in a constructive manner, otherwise possible future industrial action could bring Sellafield to a halt." Chris Jukes, from GMB, said: "Repeated requests for further talks have been ignored and the company has instead said it will impose its below inflation pay rise. "GMB has little alternative than to ask our members if they wish to take strike action to achieve a fair pay offer." A Sellafield spokesman said: "We've offered our workforce an unconditional 1.5% increase this year - which is an increase to our wage bill of over £12m year-on-year. "Like all publicallly funded organisations we have to control costs and ensure we are delivering value for money for the tax payer, so we're implementing a pay award which we feel is fair, reasonable and, most importantly, affordable."